Rare Genes from History DNA Test ranked in a 2017 wiki video guide of the best ancestry DNA tests available in the United States. For the second time, Rare Genes from History DNA Test has been ranked in the 2017 wiki of the best ancestry DNA tests. This ranking consists of a video guide and an overall look at ancestry DNA test options available in the United States. Founded in 2011, Ezvid Wiki is a free site that mainly through videos offers exhaustive, reliable and complete information. Its primary objective is the transfer of knowledge to millions of users around the world in different fields. Ezvid Wiki also has images, texts, and links to other sources of information. Currently, Ezvid Wiki is the largest video forum on the planet and is among the 3000 most visited websites in the United States. Rare Genes from History is another innovation of DNA Consultants. With this test based on 26 rare markers in your DNA you can find out what ethnic groups you have the most affinity with (Europeans, African, Indian, Asian and Native American). Rare Genes from History helps to clarify the results of the Fingerprint DNA Plus, the company’s best-selling product. DNA Consultants was founded in 2003 by Donald Panther-Yates. Its main goal is to provide customized reports and a personalized service to answer all questions about results. Also, you have access to upgrades and follow-up tests without retesting or re-sampling costs. The company is the only direct-to-the-consumer DNA ancestry service that is history and sciences-based. That makes Rare Genes from History a unique and exclusive product of DNA Consultants. 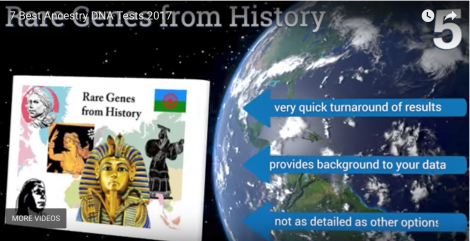 Another two tests ranked in this video are Premium Female DNA Test that analyzes the matrilineal descent from the earliest humans to the present and Premium Male DNA Test that examines the biological father’s direct male line by reviewing the markers of the Y chromosome. Follow us on Twitter and Facebook and learn more about Rare Genes from History and other DNA Products.